This Paul Simon song about New York’s Queensboro Bridge takes on a completely different character in the hands of Al Kooper, Michael Bloomfield, John Kahn, & Skip Prokop. Their Live Adventures were recorded in September 1968 at the Fillmore West in San Francisco. I bought my first copy of The Live Adventures of Mike Bloomfield & Al Kooper from Ashwoods in Sydney in 1971 (I think). It was pre-loved, of course. I bought my second second-hand copy some 2o years later when I first visited San Francisco for a few days … and a lot of walking around hilly SF. A visit to Haight-Ashbury was mandatory for an Australian Dead-Head (yes, I became a member in 1972 or 73) in SF. The longest walk of my visit. I was staying near Union Square. I walked along Market St – paid a passing homage to the car sale room that had emerged on the site of the Fillmore West (where Market & South Van Ness form a cross road) – then I strolled along Haight towards the legendary crossroad that was the centre of the “summer of love”. My pace was steady, determined … then I noticed, heading my way, bearing down on me, and seemingly staring me down, a figure reminiscent of Jules Winnfield (Samuel L. Jackson’s Pulp Fiction character). Internally I debate whether to cross the road, out of his path. Internally I was shitting myself. I decide to hold my ground, my pace, and my path. Neither of us showed signs as flinching … we approached an inevitable collision. At the last moment (less than about 18 inches away) he jumped aside, pointed his finger at me, burst out laughing and shouted “Hey brother, you’re shitting, admit it”.” Yes, you got me!” I shared the joke with him, he high-fived me and we went on our separate ways. And so I made it to Haight-Ahbury. I had to buy something from this illustrious home of hippiedom. What better than some vinyl. Recycled Records (on Haight St) – one of my purchases was my second copy of Live Adventures. 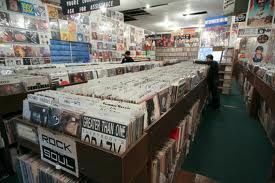 Recycled Records – Plenty of vinyl to choose from. Clearly, Michael Bloomfield is the connection here. 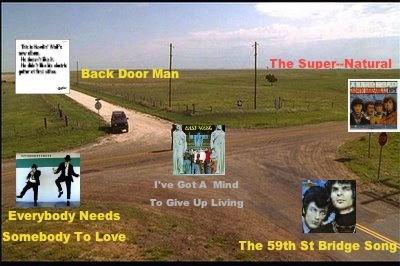 Maybe there’s a connection (or contra-connection) through the mood in the songs’ lyrics. Mind you, the Live Adventures team don’t use that part of the lyric and Paul Simon’s lilting, skipping, “life-I-love-you” lyric takes on a plaintive tone. * OK … I just have to give you this as well. Simon & Garfunkel on The Smothers Brothers show. * Mike Bloomfield: An American Guitarist : this is a wonderful website containing some fabulous material … including a recording of a lesson given by Mike to a guitarist from the SF Bay area (you’ll find it under Music/Lessons). 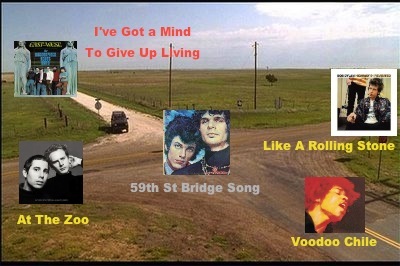 * You can also find The Michael Bloomfield Story on You Tube … split into 10 parts. * Bloomfields Doomed Field: An article about Mike Bloomfield written by Al Kooper. Kicking down the cobble-stones lookin’ for fun … but what direction? … and what sort of fun? North: I’ve Got A Mind To Give Up Living. We’ve passed that thought. East: Like A Rolling Stone by Bob Dylan. South: Voodoo Chile by Jimi Hendrix Experience. Where would you “kick the cobblestone”?